YOU have been a preceptor…. YOU have been a salvager…. Once I stepped into the broiling inferno…. I knew that I won’t survive. But then, YOU had other plans. And shepherded me along the edge…. HE stood there and smiled…. And as I limped and slithered in the slime…. “Rise from the ashes….and you will survive”- HE announced. Yes, I did ‘cling on’ and withered the storm…. “Dada, aap please jaldi aa jao, lagta hai wo mil gaya” (Bro, come over real soon, I reckon we have hunted it down) - The exuberant voice from the other end whooped. I was yet another gloomy day in Calcutta and my mood was right back off; almost as if in sync with the forlorn weather….it was as if somebody was stitching the blue-print for a tenebrous conspiracy- if the beastly impact of an unanticipated disaster was appalling enough, the aftershock was as gruesome as ever. “Tu mazak to nahi kar raha hai na?” (You’re not kidding me, right? )- I desperately pumped, I was rather skeptical. The news was unbelievable, it was too good to be true. Human psychology, my word, is convoluted. “Dada, aap aiye to sahi…hum bilkul bhi mazak nahi kar rahe” (Bro come along and see for yourself, this is not a joke) - The adolescent voice from the other side reassured. Technically I should have been overjoyed at this unexpected ‘bulletin’, but strangely I didn’t know how to react. Perhaps the news was too good to be true; but then I had to respond to the “Divine memorandum”. On a rainy day in Calcutta, the city looks absolutely beautiful bathed in the holy rain. It had started raining like Godzilla's and King Kong’s by then….it was as if Mother Nature was conspiring against me and my ‘drive’ all over again. It generally impossible to get out of office before 7 PM, but then I decided to take the gamble and guess what, just before the appraisals. The “Call” meant so much to me….you know, at times people should “mute” their judicious bent of mind and take a few instinctive calls, it does assuage your imminent agony. I almost trying to convince myself that the “Caller” was actually bluffing; but then the confidence and the immaculateness in his voice was apparently credible enough. It was extremely difficult to get a transport on that particular day, but I knew that this was my very last chance. Sector V was bitterly water-logged as always, with almost zero traffic movement…and I decided to walk right up to Karunamoyee, I wasn’t even carrying an umbrella. I was literally drenched, my corporate jacket…my trousers were soaked in rain-water, I desperately needed a cover; I had a very important client meeting to attend on the following day and falling sick wasn’t even an option. The yellow taxis were pretty much in a “Refuse-By-Default” mode and the radio taxi services were flamboyantly running at a 4X price surge; I had no other option but to frantically wave at those slow-moving crammed “Shuttle-vans” – my last ray of hope. At last I did manage to get hold of one, and almost miraculously the cabbie agreed to drop me off at the North Port Police Station near the Howrah Bridge. 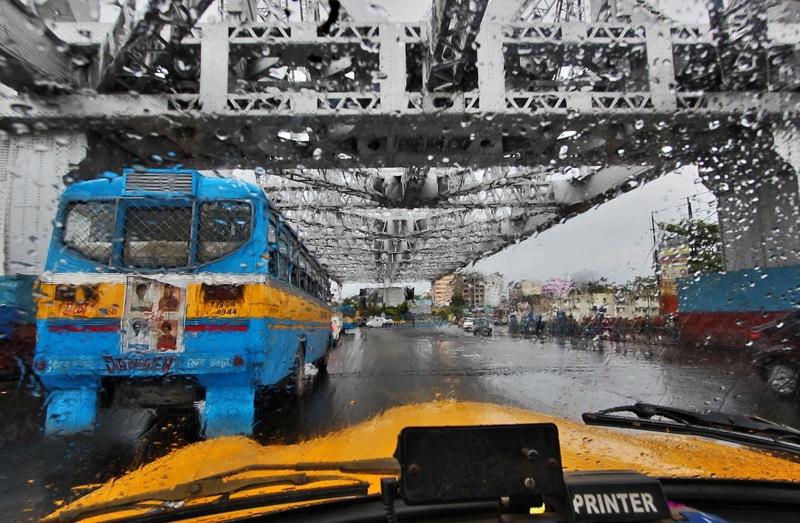 It also meant that the dreadful prospect of walking down the Howrah Bridge, wading through the torrential rain was pretty much on the cards. I had no other option but to take this route, it was going to be very tough...but “hope” was pretty much the driving force in this battle…. 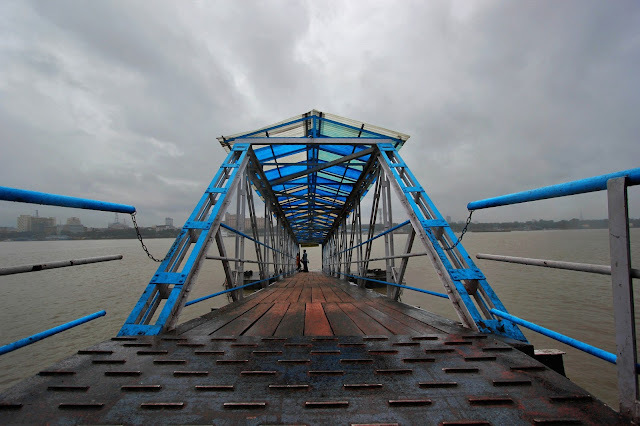 On a very gloomy day in Howrah, at the Ramkrishnapur Jetty, spells "doom" isn't it? “Dada, us din bhi sham ko aise hi baarish huwa tha…! Hum uss din dhoond nahi paye.” (Bro, it had rained so much that evening, we couldn’t carry out the search operation.) He explained…he didn’t need to. I was literally shivering in anticipation; half of his words weren’t even registering in my mind. I was frazzled but at the same time, I knew that the next few seconds could be as incisive as ever. He, however, looked as calm and composed as ever. “Dada, barish thora sa rukne dijiye…phir main lake deta hu. Waise bhi bohut der pani ke andar tha...humne koshish ki hai….” (Bro, will bring ‘it’ to you as soon as the rain stops. 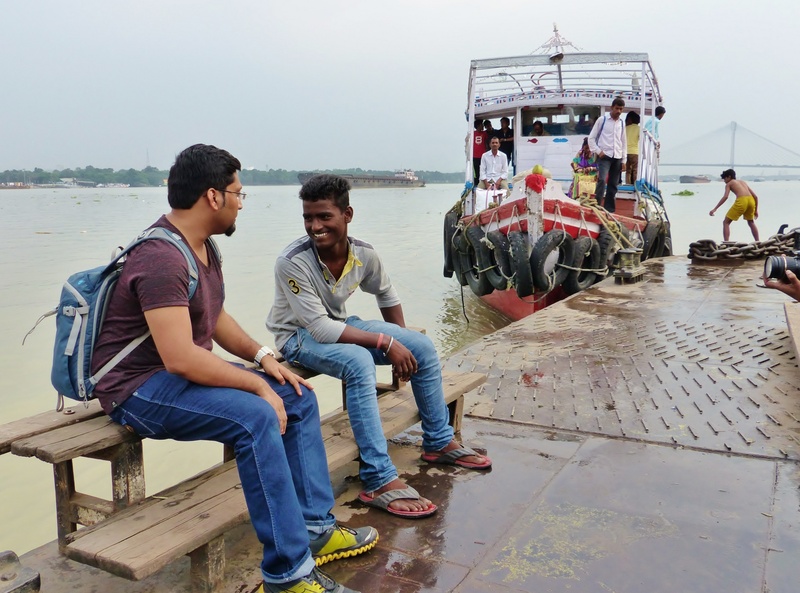 It was lying under-water for quite some time, we have tried our level best) - He recited; I was astonished by his placidity….for someone who had groped through the Ganges for the last 3 hours or so, in this rain, this was simply preposterous. “Chotu, mujhe dekhna hai…abhi” (Chotu, I want to see it right now) - I was getting impatient with every passing second. Oh dear. “Achha dada aap idhar hi rukiye…hum leke aatein hai…” (Ok wait right here, let me bring it for you)- And he rushed out in the rain, I think he could sense the exact state of my mind, my concern, my wretchedness. Such maturity, such augmentation for an 18-year old! He returned in just about 5 minutes with a venerated cylindrical body wrapped carefully a polythene sheet and handed it over to me. I gently un-rolled the sheet; my heart-beats had attained the speed of light by then, I don’t know whether I was sweating or was the rain-water, my word, it was the most difficult 10 seconds of my life…this was “the moment”. Goodness me! This young chap wasn’t bluffing at all…he had, in-fact, quite impulsively pulled off something extraordinary. He was already a hero in my eyes. He had done something that perhaps nobody could have even dared to have attempted. UNBELIEVABLE. Okay. 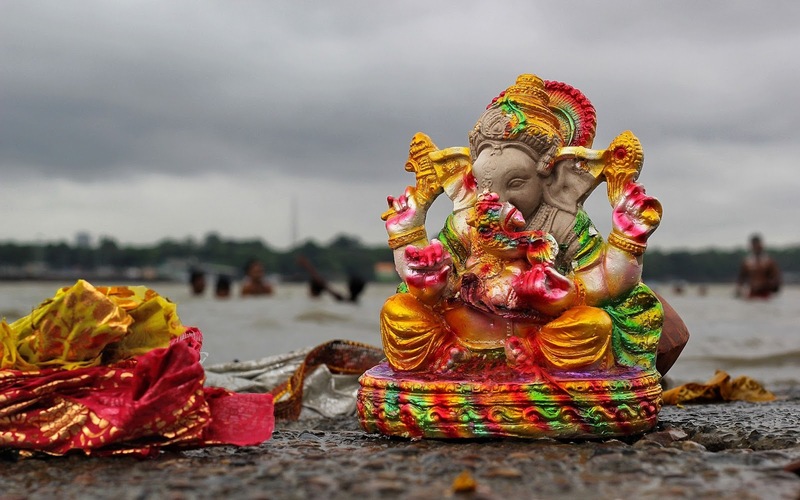 Before I get to the details, let me ask you this question….how often do you expect to recover something that has been accidentally dropped in to the Ganges that too during the high tide? I reckon the chances are as slim as 0.0001%? And I think I am still over-stating. But then miracles do happen...and when it does, all you can do is to thank the Almighty for being there and featuring you an integral part of the script. My experience was nothing less than a sensation; when you lose all your hope and something crops up out of no-where, you do take time to sink in….it’s a bewildering experience indeed. 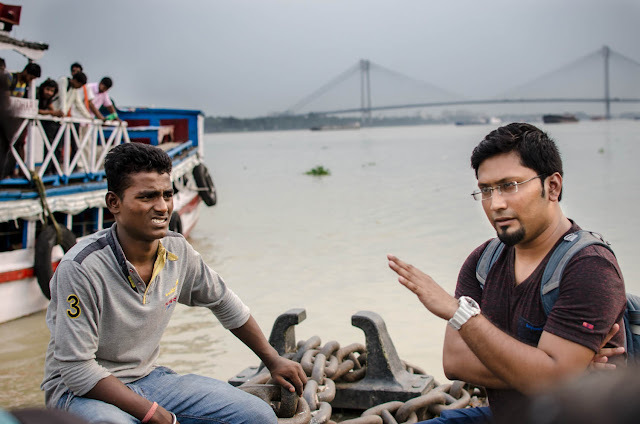 In case you haven’t guessed it already, the heavy cylindrical object that I was referring to in the last segment, was my beloved Canon 10-22 mm wide angle lens that I had dropped accidentally dropped in the Ganges while shooting at the Ramkrishnapur Ghat. If you have followed my blog, you would have known that I am a street photographer based out of Calcutta and I’m mostly out “on the field” during the weekends to capture the “moods of the city”. 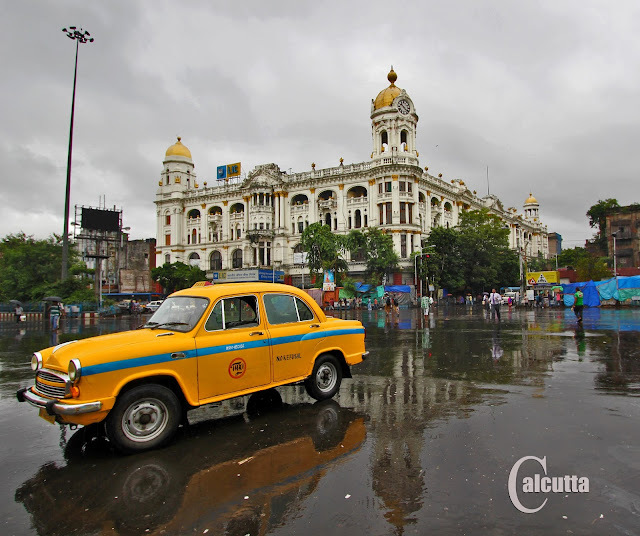 This Sunday was no exception, it had been raining since the last couple of days and we, the core team-members of Calcutta Instagrammers, decided to go out and photograph the “freshness” of Calcutta…bathed in the rain. The photo-hunt did begin quite well, with some inspiring frames being shot at the Esplanade in the first half and we decided to head over to “the other side” of the Ganges to get a clearer perspective of the brewing cloudscape….that’s when it all happened. I was almost through with my shoot at the Ramkrishnapur Ferry Ghat and was merely changing my lenses when I lost my grip and the prized lens rolled down into the Ganges. It was partly attributable to the mini quake caused by an arriving launch at the very instant when it drops its anchor to the ferry. I have been a trained swimmer and my instinctive call was to dive into the water, but thankfully I controlled the stimulus…it could have been a suicidal attempt during the high tide. I held on to my nerves, took a closer look and spotted some teens with athletic built resting at the Ghat…judging by experience, I deduced that they could be good swimmers; I decided to make an attempt. 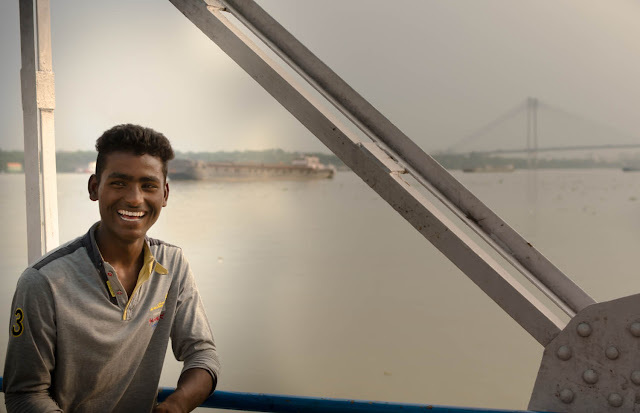 And I was right on the money; these teens have “braved” the Ganges on multiple occasions and one of them (the hero of our fable, Chotu) agreed to my request almost instantaneously. 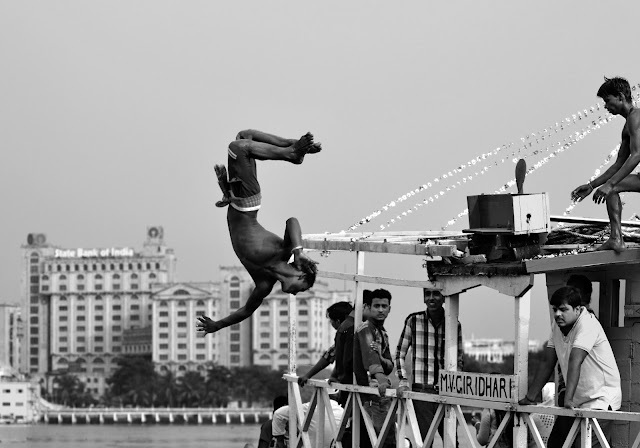 When he dived into the Ganges spontaneously without an inch of disquietude, I knew that he was my man. We all know how deep the Ganges could be and the lens had settled pretty much on the river bed…it was quite a challenging task to hold your breath for an extended period and also resist the flow. He frantically searched for an hour but in vain…the flow during high tide was too strong to cope with; I could see the disappointment on his face- this was perhaps the first time that he had failed in his attempt. We had, in the meanwhile, come to know that he has been a life-saver (he has saved almost 10 people from drowning), he has contributed a lot to the society already. 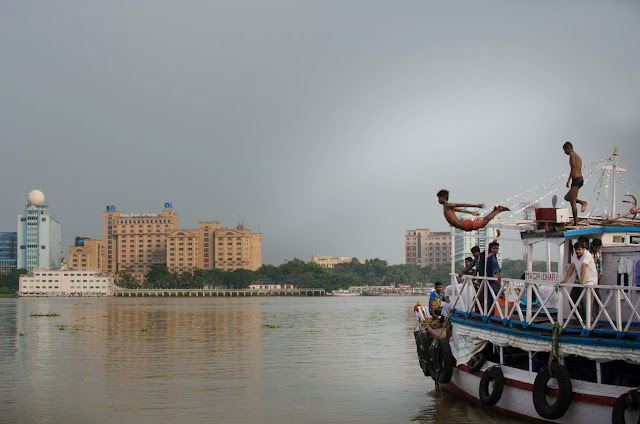 He was a gifted swimmer and traverses the Ganges almost once every-day. I could sense the veracity in his ‘constitution’, his passion, his dedication and ‘candidness’…but I didn’t want to risk his life, it was quite an in executable task to track a tiny cylindrical object in this “ruthless flow”. I had requested him not to be go back again and rewarded him with a solitary hundred rupee note as a mark of appreciation for his gallant effort. I loved his spirit to the core & it was a mark of respect. He accepted it reluctantly. But somewhere down the line, I knew that the fighter in him won’t give up and I was perturbed; the exuberance of youth can be precarious at times. And he did exactly what I had expected and astonishingly came up with unexpected results. A couple of days later, he decided to take up the challenge once again and after a breath-taking 3 hour-long under-water ‘expedition’, managed to dig it out. It sounds all too simple I know, my word…it’s nothing less than phenomenal. 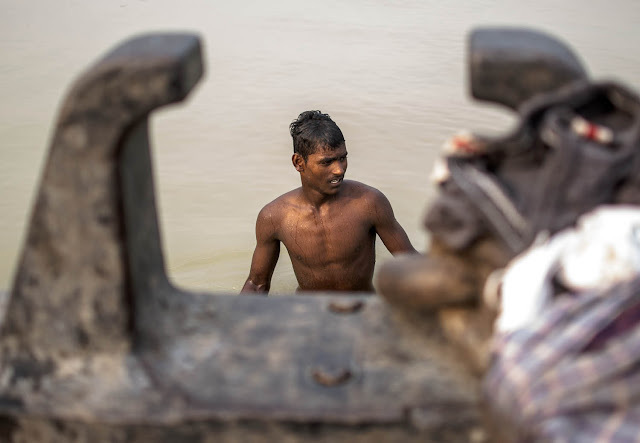 The lens had settled right at the bottom of the Ganges and had been carried away considerably far in the flow; more than skills it needed the power of estimation, tenacity and determination to get it done. I’m so proud of you young man, you have left a permanent impression in my heart. And I am not overstating when I say that we need people like you to turn up and enliven the sinking future of the country. The fact that you refused to avail any monetary compensation strengthens this impression; you are amazing !! We decided to go back to the spot and shoot a small video testimonial (this video featuring my interview with Chotu was shot and edited by my friend Nabanil Sanyal) for this young man who aspires to join the Indian Army and serve the Nation. He is educated, can speak decent English and loves his family more than himself. Unfortunately, he has an ailing father to look after, and is genuinely running short of funds with every passing day. We have also decided to set-up a fund-raiser for Chotu to cover his education and family crisis, the work is in progress. If you would like to contribute, please do get in touch with me. *An update, the lens was lying on the river bed for over 2 days and the moisture did do substantial damage to the internal circuitry. However, the good news is after being repaired by the “Lens Doctor”, it’s working just fine. It’s perhaps not as “sharp” and “agile” as it used to be, but it has recovered incredibly well and is doing a great job. My friends keep saying that it has been “revived” by Maa Ganga; I would rather give it to the Young Turk who fought against the odds and “rescued” it. You are a brave-heart my friend. I have certainly met two #madeofgreat entities through this moving episode, an inspiring human being on one hand and my gutsy little wide-angle lens that survived this crusade- it has been aptly christened as “Lazarus” by Preeti Roychoudhury who was there with me right through this ensorcelled chapter. Thanks Sujoy for your continuous support. 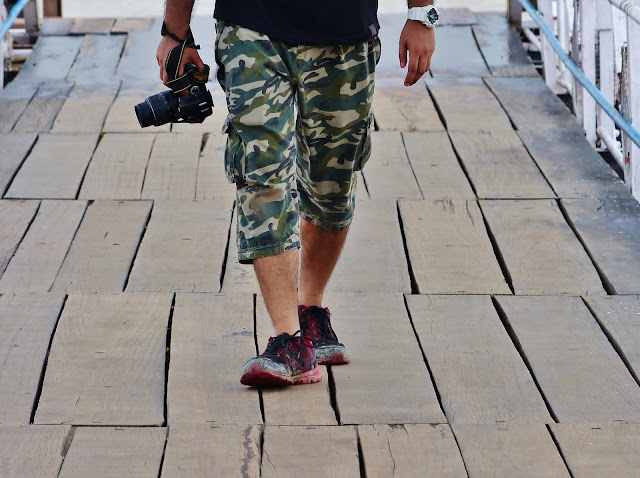 * Disclaimer: All the pictures used in this blogpost have been either self-clicked or clicked by my two friends Sujay Kumar Das and Preeti Roychoudhury and should not be copied/reproduced in any form without my prior approval. * Contest Time:  What do you think of Tata Motors association with Lionel Messi? Answer in the comments below. Answer this simple question and the best response gets  shopping voucher worth INR 750/-. Want to know more about the #madeofgreat initiative by Tata Motors? Click here.